On December 16 1944 the Germans launched a massive coordinated offensive through the heavily wooded area of the Ardennes Forest with the intent for securing the port of Antwerp in order to cut off the allied supply line. The 101st and 82nd Airborne Divisions were quickly moved from camps in France to shore up the American front line that was crumbling under the speed and mass of the German attack. All major roads and rail lined passed through the small Belgian city of Bastogne. The German capture of this important transportation hub would allow the Germans to quickly move forces west to Antwerp. On 18 December 1944, the 101st Airborne Division moved from Camp Mourmelon, France to Bastogne driving through rain and snow flurries in the back of 2 ½ and 10 ton trucks. The later serials most of the 107-mile trip traveled in darkness throughout the night. All parts of the column were forced to buck the mass of vehicles streaming back to the west from the front. The move was made in good time with some elements taking only eight hours to reach Bastogne. 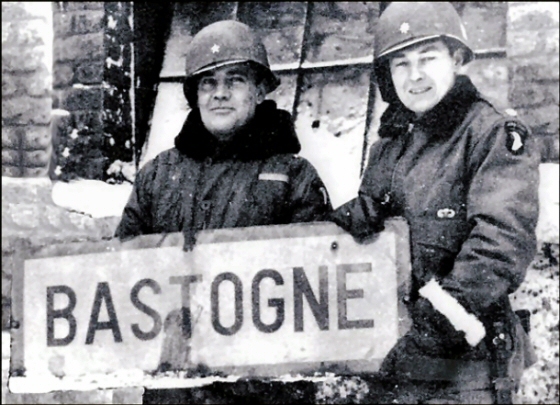 By 0900 on 19 December, Brigade General McAuliffe, the acting division commander, had all four regiments of the 101st around Bastogne. Soon after arriving in Bastogne, the paratroopers of the 502nd began digging defensive positions along the north and northwest portion of the defensive perimeter surrounding the city. 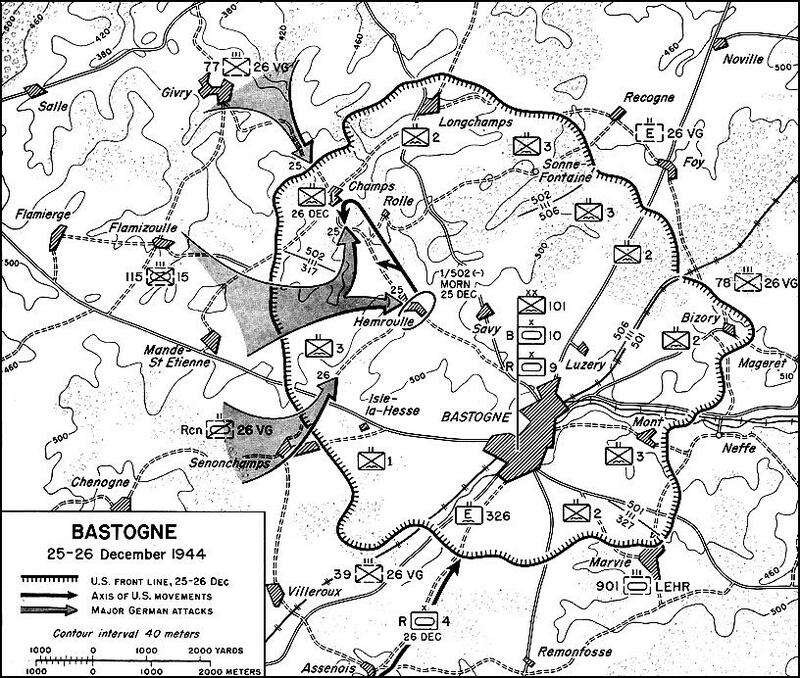 On 20 December 1944, German forces completely encircled the defenders of Bastogne. 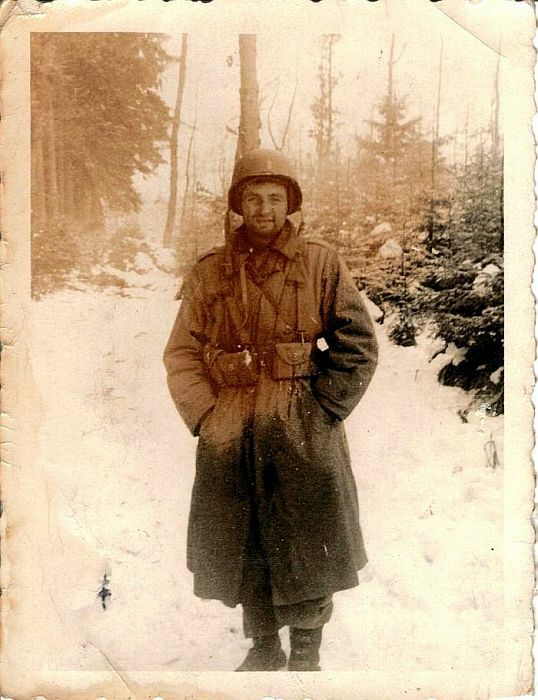 "It was on this day, 20 December," reads the war diary of the 327th Glider Infantry, "that all roads were cut by the enemy...we were completely surrounded.” The German siege of Bastogne cut off the supply convoys that were delivering supplies to the paratroopers. The 101st has to rely on other means of resupply; airdrops. The airdrop scheduled for 22 December never reached Bastogne as bad flying weather prevented the resupply mission from reaching its destination. All that the Third Army air liaison staff could do was to send a message that "the 101st Airborne situation is known and appreciated." Artillery ammunition was running very low. The large number of wounded congregated inside Bastogne presented a special problem: there troops to wrap the men suffering from wounds and shock. Nonetheless, morale remained high. Late in the afternoon word circulated to all the regiments that the 4th Armored Division and the 7th Armored Division were on their way to Bastogne; to the men in the line this was heartening news. Even though only the 4th Armored Division was headed to Bastogne the rumors of both divisions approach improved morale among the men. About noon on the 22 December four German Soldiers under a white flag entered the lines of the 2d Battalion, 327th GIR. The terms of the announcement they carried were simple: "the honorable surrender of the encircled town," this to be accomplished in two hours on threat of "annihilation" by the massed fires of the German artillery. The rest of the story has become legend: how Brigadier General McAuliffe disdainfully answered "Nuts! "; and how Colonel Harper, commander of the 327th, hard pressed to translate the idiom, compromised on "Go to Hell!" The ultimatum had been signed rather ambiguously by "The German Commander," and none of the German generals then in the Bastogne sector seem to have been anxious to claim authorship. 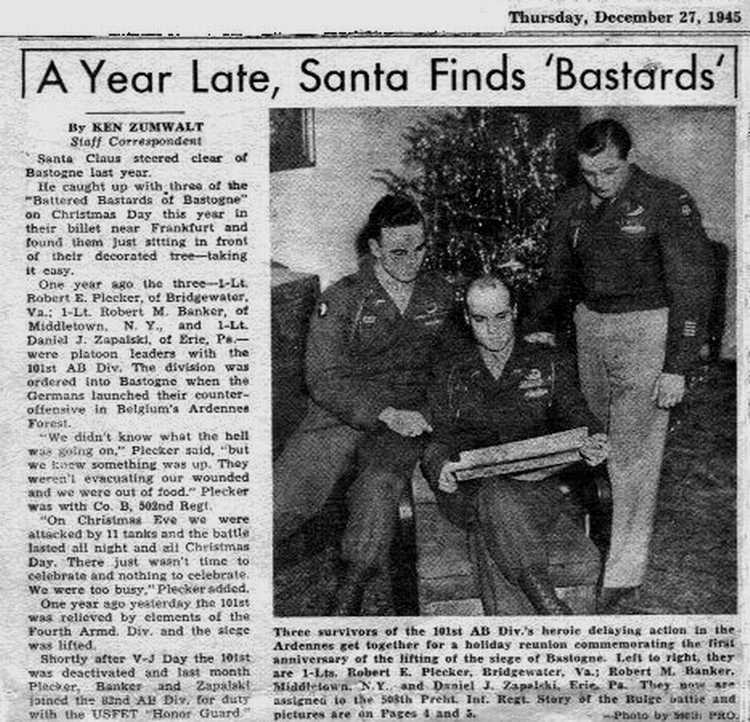 Lt. Col. Paul A Danahy, G-2 of the 101st, saw to it that the story circulated-and appropriately embellished in the daily periodic report: "The Commanding General's answer was, with a sarcastic air of humorous tolerance, emphatically negative." Nonetheless the 101st expected that the next day would be rough. The weather on the morning of 23 December was cold but clear. "Visibility unlimited," the air-control posts happily reported all the way from the United Kingdom to the foxholes on the Ardennes front. To most of the American troops this was a red-letter day-long remembered. Bombers and fighter-bombers once more streaked overhead like shoals of silver minnows in the bright winter sun, their sharply etched contrails making a wake behind them in the cold air. In Bastogne, however, all eyes looked for the squat planes of the Troop Carrier Command. About 0900 a Pathfinder team dropped inside the perimeter and set up the apparatus to guide the C-47's over a drop zone between Senonchamps and Bastogne. The first of the carriers dropped its six parapacks at 1150, and in little more than four hours 241 planes had been vectored to Bastogne. Each plane carried twelve hundred pounds of supplies, but not all the aircraft reached the drop zone nor did all the parapacks fall where troopers could recover them. Nevertheless the day's drop lessened the pinch. On 24 December a total of 160 planes dropped supplies. Poor flying weather on Christmas Day virtually scrubbed all cargo missions, although eleven gliders did bring in a team of four surgeons and some fuel and oil badly needed for the tanks. The biggest airlift was on the 26th when 289 planes on flew the Bastogne supply run. 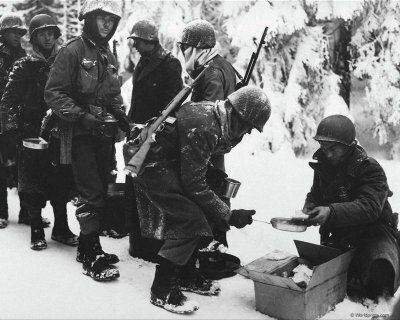 The airdrop on the 23 December brought a dividend for the troops defending Bastogne. The cargo planes were all escorted by fighters, their protective mission accomplished, turned to hammer the Germans in the Bastogne ring. During the day eighty-two P-47's lashed out at the enemy with bombs and machine gun fire. The 101st reported to that the "air and artillery is having a field day around Bastogne." About 0300 on Christmas morning, a several German planes droned over the Deuce’s position and dropped bombs indiscriminately around Rolle, the 502nd regimental command post. A few minutes later German gunners and mortar crews started firing on the American positions at Champs. Able Company was deployed on the northwest edge of the village, its right flank joining the 2d Battalion in a large wood lot midway between Champs and Longchamps. Clad in white snow suits some fifty grenadiers from the 77th Panzer Grenadier Regiment crept forward toward Champs under the low light of the waning moon. At 0400 the 77th dashed into the village of Champs. Soon, more German troops moved through the woods against the left flank of the 2d Battalion. Within the hour a full German battalion had joined the fight. Company B moved up to support A Company, but the confused melee around Champs in the predawn darkness pinned the Germans down. Shortly after the initial attack, eighteen German Mark IV tanks and the riding grenadiers of the 15th Panzer Grenadier Division had broken through positions held by Companies A and B of the 327th Glider Infantry Regiment before dawn and got as far as the battalion command post. Several of the enemy tanks passed straight through artillery battery positions in the rear of the 327th. Just west of Hemroulle about half the German tanks wheeled left, defiling along a cart path which led to the road between Champs and Bastogne. As they approached the road the panzers formed in line abreast, now bearing straight toward Companies B and C of the 502nd, which were on the march to help the Able Company paratroopers in Champs. Lt. Col. Chappuis had a few minutes to orient his companies toward the oncoming tanks, but two tank destroyers from Company B of the 705th Tank Destroyer Battalion absorbed the initial shock and were knocked out as they fell back toward the Champs road. As the panzers rolled forward, Company C made an orderly withdrawal to the edge of a large wood lot midway between Champs and Hemroulle. The Paratroopers showered the tanks with fire, and the German infantry clinging to the decks and sides fell to the snow. The tank detachment again wheeled into column, this time turning toward Champs. Two of the 705th tank destroyers, which were supporting Company C, caught the column in the process of turning and destroyed three of the panzers while the paratroopers destroyed two more with bazookas. John Ballard of Able Company accounted for one of the two German tanks destroyed by paratroopers in Champs. The half of the enemy formation which had kept on toward Hemroulle after knifing through the 327th encountered the a furious cross fire laid down by four of the 705th tank destroyers, tanks, artillery, and bazookas handled by the men of the 327th GIR. As recounted by Col. S. L. A. Marshall after the battle: "The German tanks were fired at from so many directions and with such a mixture of fire that it was not possible to see or say how each tank met its doom." The survivors of those panzer grenadiers of the 1st Battalion who had ridden into battle on the tanks found themselves surrounded and alone, for the American rifle line had sealed itself after the initial armored punctures. About fifty German riflemen who had hidden in a stream bed were captured by artillerymen from the 755th. A "relief column" heading for the Bastogne perimeter consisted of the three Sherman tanks commanded by Lieutenant Boggess, in the lead, followed by a half-track, and two more Shermans bringing up the rear. Lt. Boggess moved quickly, firing machine guns into the tree line. After a mine destroyed the half-track and the armor crews removed mines form the road, the column approached the American lines. On 26 December at 1650, Lt. Boggess saw engineers in friendly uniforms preparing to assault a pillbox near the highway. These were men from the 326th Airborne Engineer Battalion. Twenty minutes later Col. Abrams shook hands with Brigadier General McAuliffe, who had come to the outpost line to welcome the relieving force. 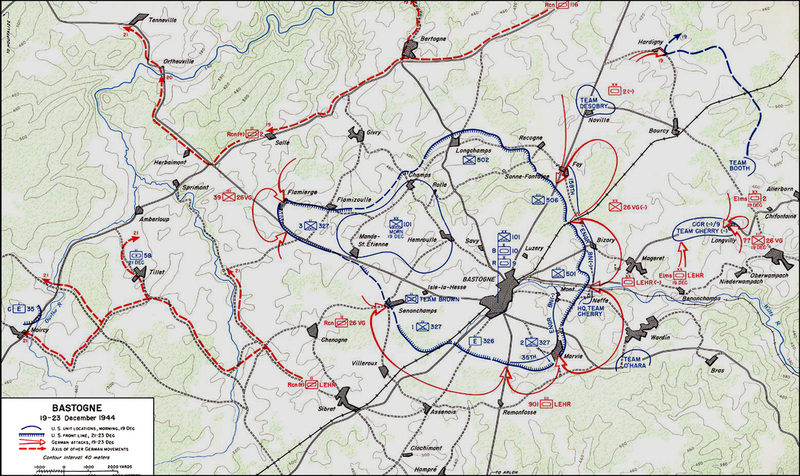 The 4th Armored Division breach in the German encirclement of Bastogne was narrow and precarious, but it would remain open despite the most strenuous enemy efforts in following days. On 3 January 1945, the 19th SS Panzer Grenadier Regiment of the Hohenstauffen Division attacked 2d Bn north of Longchamps, Belgium which resulted in the capture of 40 Paratroopers, mostly for Fox Company. The following week’s fighting was bloody and intense along the railroad line running northeast through the Bois Jacques Forest. During this drive on 14 January 1945, Lt. Col. John Stopka was killed by friendly aircraft strafing a nearby target and Cecil Simmons became the third and final commander of 3d Bn. Despite the German resistance the 502nd captured their objective at Bourcy, Belgium.